I've written about the overall food trends, my favorite sweet and savory finds and now the final post about the show, with the rest of my picks. 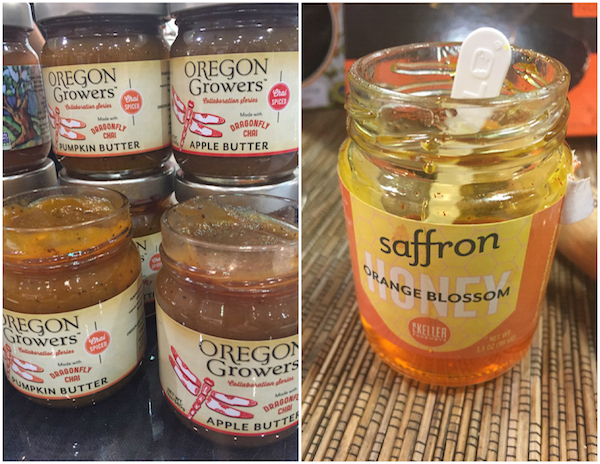 I’ve long been a fan of Oregon Growers' great fruit jams and butters. Now they’ve collaborated with Dragonfly Chai and the result is luscious apple butter and pumpkin butter tinged with chai spices. They are both really good, not too sweet with warm spices like cardamom, ginger and black pepper to complement the flavors or apple and pumpkin. Perfect to swirl into yogurt, oatmeal or slather on toast. I’m a complete honey fanatic and love the way honey reflects the aroma and flavor of flowers. I also enjoy the way honey combines beautifully with lots of other ingredients such as nuts, fruits and spices. While I love truffle honey, this saffron honey from KL Keller Foodways really made me swoon. Saffron with honey makes perfect sense, since saffron comes from the stigma from the crocus flower. In this case orange blossom honey combines with powdered saffron to create something very rich and exotic. Use it on cheese, roast chicken or pork, or to sweeten ice cream, yogurt, or whipped cream. It should be available from Market Hall Foods. Making caramel out of coconut is becoming a thing. The product that impressed me the most in this category were the coconut caramel candies from Hey Boo, known for making delectable coconut jams. Cristina Widjaja is a bit of a kitchen ninja and her soon to be introduced coconut caramels come in flavors like Ginger Rum, Thai Iced Tea and Sea Salt, but my favorite was the Vietnamese Coffee which seemed the least sweet to me and had a very pleasant and rich coffee flavor. I was excited to try Treehouse Chocolate Company’s hot chocolate and it did not disappoint. This product was part of the Food Fete event which takes places concurrently with the show. Aaron Koch imports organic cacao and makes a truly luxurious and yet convenient hot chocolate. It comes in various flavors including one with a pinch of cherrywood salt and another with coffee. It’s everything you want hot chocolate to be, rich, creamy and very chocolate-y. It would be a great thing to include in a gift basket. Purple power! I had no idea there was a whole company dedicated to beets. Love Beets makes a number of interesting and delicious beet based foods. While the panel chose the Smoky BBQ Shredded Beets for the trend report, I was even more impressed with their beet bars which come in apple, blueberry and cherry. They have an interesting mix of ingredients including beet juice concentrate, fruit, chicory root fiber, sunflower seeds, pumpkin seeds, whole grain protein powder and orange pulp. They are nut free, gluten-free and a good source of fiber. Most importantly, they are really tasty! Dried fruit usually has a chewy texture but the fruit from California Crisps is crunchy and true to the name, crisp. Paper thin slices of fruit are dehydrated to create a perfect snack or garnish for dessert or a cheese plate. I would definitely buy these and hope they find greater distribution since they are mostly available in Southern California at the moment. KL Keller is now importing the most succulent cod fillets in olive oil from the Basque region. Bacalaos Alkorta cooks the cod gently in olive oil, so that the result is much like confit--tender, flavorful and rich. A perfect pantry staple for dinners on the fly. Find the cod at Market Hall Foods. 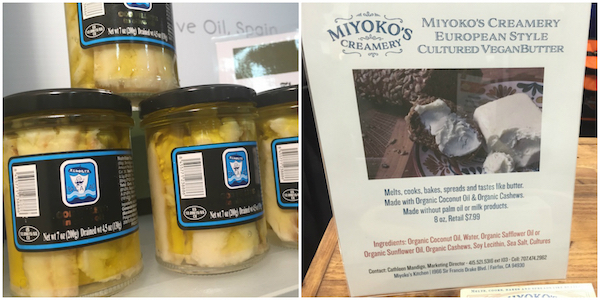 This was my first time trying the products from Miyoko’s Kitchen. They produce a variety of vegan creamery products. I liked the various “cheeses” it but was most impressed with her European style Cultured VeganButter. It’s made from organic coconut oil, safflower or sunflower oil, organic cashews, soy lecithin, sea salt and cultures. It was amazing how much it tasted like butter! I’m not giving up butter but I would certainly recommend this product to anyone who is interested in a plant-based diet. I love using tortillas, rice paper and even sheets of nori to make wraps instead of traditional sandwiches. Now there’s another option, from Pure Wraps, made from coconut. It’s mild and very flexible. I hope this product becomes more widely available soon. A few years ago I wrote about some elegant charcoal crackers I discovered at the Fancy Food Show. I expected to see more products with charcoal but I really haven’t seen that much more in the charcoal department. 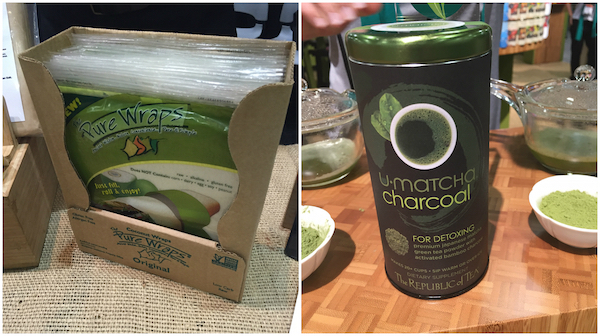 This year The Republic of Tea launched new matcha tea with charcoal. It’s part of their U-Matcha line. I didn’t try all the teas, but the charcoal version was particlarly gentle and light with none of the bitterness I sometimes associate with matcha. The green tea and activated bamboo charcoal is supposed to be supportive as part of a “detox” program. I’m not so sure about detoxing, but am I sure this is a lovely new tea.